Step 1: Plug the Smart Adapter to the microUSB port on the Galaxy Note 3. You don't need to plug the power adapter because the phone uses MHL 2.0, which powers the adapter once plugged in to the port. Step 2: Connect one end of the HDMI cable to the HDMI port on the adapter and the other to the HDTV port. Step 3: Turn the TV on and choose the correct source; it should mirror the display of your phone immediately. That's how you set up the wired connection using the special Smart Adapter from Samsung. The AllShare Cast Wireless Hub is yet another Samsung product built to make connectivity between mobile phones and other devices easier...but then again, at a price. The hub is offered at $99.99, which is obviously steeper, but it's worth it according to reviews from owners. Step 1: Plug one end of the HDMI cable to the port on your TV and the other end on the HDMI port on the hub. Step 2: Now connect the power adapter to the port on the hub and then plug it into the approved power source. Step 3: Change the input source on your TV to match the HDMI port where the cable from the hub was connected. Step 4: The status indicator on the hub will start blinking red, press the Reset button. The indicator will now turn blue. Step 5: On your Galaxy Note 3, go to Settings > More settings > AllShare Cast. If you have one hub there should only be one device that would appear on the screen, tap on it to being the mirroring. As of this writing, there is no known compatibility issues so it should work without a problem. I am familiar with Belkin Miracast Video Adapter, which is a dongle that needs to be inserted into the HDMI port of the HDTV so the unit could receive data from other devices. The last time I checked, the adapter is marketed for $69.49 at Amazon.com. The price may still be steep for some but the setup is straightforward. Step 1: Plug the Miracast video adapter to an HDMI port at the back of your TV. Step 2: Change the input source to match the HDMI port used by the adapter. Step 3: On your Galaxy Note 3, swipe from the top of the screen to the bottom and tap the Quick Settings icon and tap the screen mirroring icon to turn it on. Step 4: Now choose your TV from the list of available devices to start mirroring. You should be able to display what's on your phone's screen to your TV. This method can still be considered wireless because it uses the Near Field Communication (NFC) technology to transfer data but the most convenient way to do this is to place the phone directly above the HomeSync device. By the way, HomeSync is another Samsung device marketed at a price of $299. The thing is, it's not exclusive to Samsung devices only, if you have other NFC mobile phones, you can use this mirror their displays as well. Step 1: As usual, one end of the HDMI cable goes to the port on the HomeSync while the other to the back of the TV. You should also change the input source to match the port used. Step 2: Plug the power adapter of the HomeSync and then press and hold the power button for 3 seconds to turn it on. Step 3: If you want you can manually install the HomeSync app on your Note 3, otherwise, you just have to place the phone on top of the device and it will automatically be directed to HomeSync app download page. Step 4: Once the app is installed, place the phone on top of the HomeSync and launch the app. You may need to enter your network credentials. Step 5: On the home page of the HomeSync app you can find the Screen Mirroring options, tap on it to begin sharing your phone's display on your TV. If you have an HDTV that supports HDCP 2.0 Screen Mirroring, then you don't have to worry about buying any of the accessories previously mentioned. To make it easier for you, change source input and try to see if you can find Screen Mirroring option. If there is, then the TV supports HDCP 2.0 screen mirroring feature. 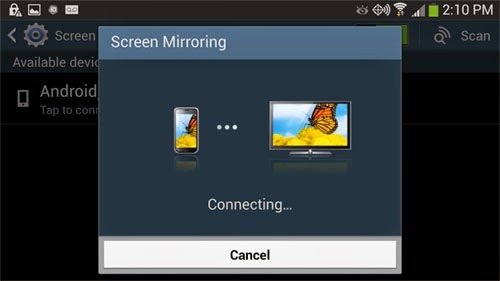 Step 1: Change source input of your TV to Screen Mirroring. More often, you will be given two minutes to connect your phone, so after doing this, immediately set the phone to mirror. Step 2: On your Note 3, go to Settings > More settings > Screen Mirroring. Go within 3 feet to make sure the phone can detect your HDTV. Step 3: Tap on the device displayed on the screen of your phone and that's it, screen mirroring is now on. Of course, repeat the steps in case the first attempt fails.